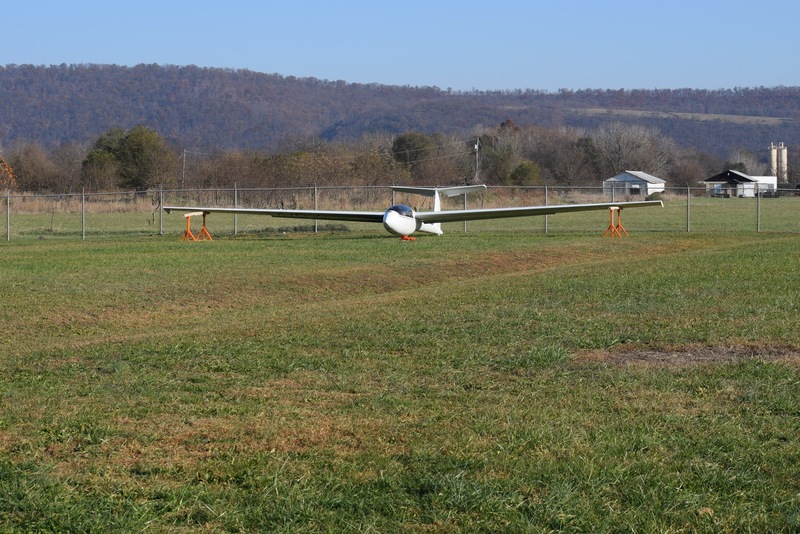 Recently, a commercial gliding operation has opened up within a [relatively] short driving distance from home. Eastern Soaring Center has opened for business. 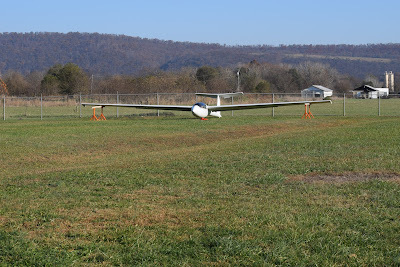 They offer a dedicated environment to help students work on all of the fundamentals of soaring, except for aerotowing. This operation is run by Brian Collins. Brian is retired Air Force. He has been flying gliders since his days at the Air Force Academy. He has been giving glider instruction at many different glider clubs across the US, including the Civil Air Patrol encampments in Mattoon Illinois. In 2013, Brian was also the first or second US citizen to get the 1250 kilometer distance flight badge. I made an appointment to get my winch launch certification. I've never done a winch launch before, and I've never seen a winch operation in action before. Back in the old days, most glider pilots had the words "Glider - Aero Tow Only" printed on their pilots certificate. In 1997 this certification was obsoleted. Since 1997, all you need is a logbook endorsement for any of the launch methods: Aero-tow, winch, or self-launch. For all of the 1800 glider flights I've done in the past, it's been on the end of a 200 foot rope connected to an airplane with a strong enough engine. The acceleration on takeoff is slower than the acceleration you'd experience in a car merging into traffic on a freeway. Once the glider has enough airspeed, the glider gets airborne usually just before the tow plane starts to climb. 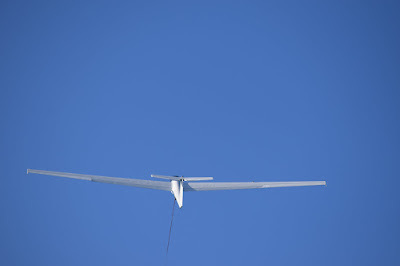 The tow plane and glider climb to release altitude, where the glider pulls a release knob, and lets the tow plane go. This usually takes about 6 minutes to climb to 3000 feet. In contrast, a winch is a power plant that stays on the ground. Hook up a 300 horsepower engine to a spool of 5000 feet of cable on one end. Hook up the glider on the other end. When the glider is ready, gun the engine. The majority of that 300 horsepower is dedicated to the glider's acceleration. Within 1 to 2 seconds, the glider is off the ground. 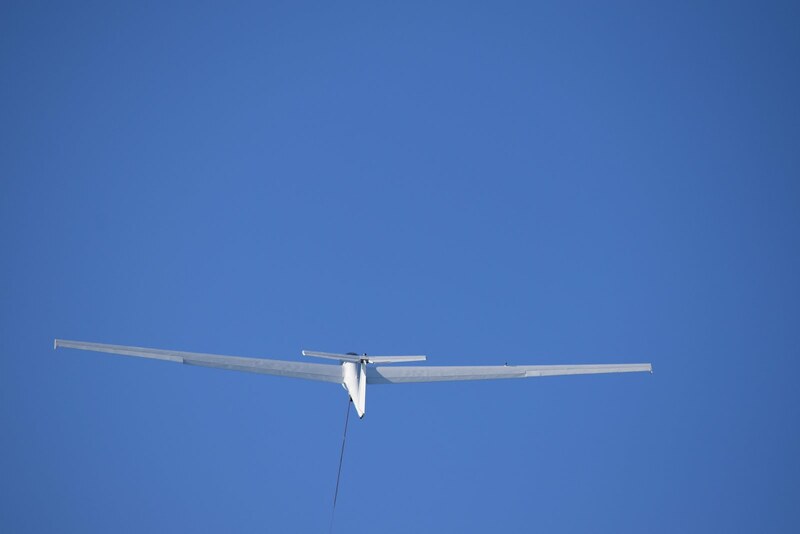 Within 40 seconds, the glider has climbed to its highest point, and released to start its free-flight. Eastern Soaring Center's Winch. The pickup truck is a mass anchor that helps keep the winch in position. When launching with the winch, the acceleration is really hard to describe. The closest thing I can use to describe the acceleration is when sitting in a Tesla that is accelerating in ludicrous speed mode. After the slack is taken out, the winch's engine RPM is gunned to maximum. The glider has accelerated to flying speed within 1 to 2 seconds. The next 2 to 5 seconds, the glider increases its climb angle. Not too quickly, and not too slowly. Too quick of a increase in pitch, and the glider risks having an acceleration stall and crashing into the ground. Too slow of an increase in pitch and the glider doesn't climb as well. This critical phase of the launch is also when a break of the rope could be disastrous. If the rope breaks, the pilot must immediately recognize it and immediately lower the nose well below the horizon. We practiced this emergency release several times at varying altitudes. Here's a video of one such break, from the Netherlands. 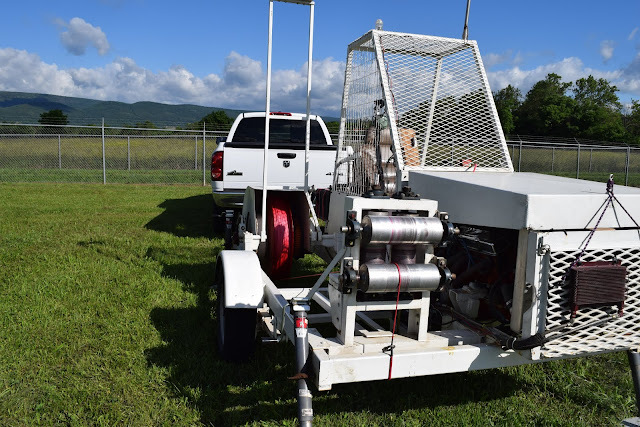 In the United States, a winch launch is a relatively rare procedure. This is much more common launch method in Europe. The British Gliding Association recently had a safety initiative to improve the safety record of winch launching. After their initiative (Safe Winch Launching at the BGA's website) the accident rate dropped significantly. The safety record of winch launching has improved to a lower accident rate than what is seen with the aerotow launch method. One of the best advantages of the winch is the lower operating cost. With an aerotow, all of the glider pilots who use the tow plane for launches are sharing the creeping costs of the tow plane. Every hour the tow plane flies, it is ticking ever closer to the eventual overhaul. Every airplane that has an engine needs to have its engine removed, and essentially is totally rebuilt every thousand or 1500 hours. Also adding to the cost of an aerotow is the training required for a tow pilot. The cost is mitigated by using a volunteer work force in a club environment. At a commercial establishment, the tow pilot is going to expect to be paid. The cost of fueling the tow plane is rather unpredictable. Fuel that is suitable and certified for an airplane is much more expensive than the fuel you use in your car. The advantage I'm most interested in is availability. Sometimes I see the weather forecast and know that it is going to be one of the best flying days of the year. Unfortunately, that day is a Tuesday. One of the disadvantages of being a weekend-only flyer is that there is a poor chance that the good flying day is going to end up on a weekend. About 28% chance, that is. Sometimes the really good flying days mean exciting takeoff and landings for the tow pilot. While I only have to endure one take off and one landing on the really good flying days, our tow pilot must subject himself to as many takeoffs and landings as there are brave pilots willing to fly that day. Sometimes when I come in for a landing on those days, I'm just happy I made one landing. To think that the tow pilot has to do this a dozen times on these days is commendable. Many times, the tow pilot will cry "uncle" after a few launches, when conditions are too sporty for him. While there are times the winch operator is going to call it quits because of sporty flying conditions, I don't think the number will be as high. There were only three people involved in this operation. The winch operator, the instructor, and me. For all winch launches you need to have a wing runner. If the glider's wingtip ever drags into the ground, the glider violently cartwheels and is destroyed. These sorts of accidents are often fatal. The only solution is an immediate release of the rope. To do this operation without having a wing runner, Brian created these cool wing skids. They are the right height, covered with soft carpet, and steady the wings better than a wing runner can. After 9 flights with Brian, training me to do a winch launch, he was ready to solo me. We had covered all of the emergency procedures. We practiced most of these, varying from 20 feet of altitude to 400 feet of altitude. Depending on the point of release, we would do S turns, a 360, or a straight ahead landing after the rope break. Brian let me go for a solo flight, and I was excited as I was when I had my first solo at age 15, back in 1988. On the second day, Brian and his son Marshall worked to get me 5 solo flights in the Twin Lark. The airfield at Petersburg is long enough to stage the glider at 2/3rds down the runway. I launch to a satisfactory altitude of 1700 feet above the ground. I circled around, landed, and stopped within 10 feet of the previous launch. Brian hooked me up, and I was off again. I've never done 5 takeoffs and landings so quickly before! My next challenge is to do a winch launch on a good ridge day, and then go out and do a diamond altitude climb ( 5000 meters of altitude climb, 16,404 feet), or a 500 kilometer diamond distance course. Now that I'm checked out, I'm looking forward to the challenge. I'm going to recommend that some of my students come visit Brian. Especially the students who can't figure out that last few moments of flying phase. If you need landing practice, doing the winch launch is a great way to pound out some flights really quickly.